Any conservative that believes our welfare state beast will allow social programs to be cut with pain and them remain in power is a fool in my view. If republican and conservatives do get a Trifecta in November 2016 they will have one last chance to save the USA and western civilization. Plus, they can save the USA and western civilization and keep power at the same time by repealing the Godforsaken insane arch-evil 1938 socialism minimum wage law. Doing that will untie our all powerful free market place economy which will absorb all blame and save the USA and western civilization. That is the only hope of saving individual freedom in the world today, otherwise liberalism will prevail. Liberalism is going to drive the USA into a dictatorship or some other form of authoritarian rule, period. It is impossible to retain a free society without discipline, responsibility, and accountability which is fast going by the wayside here in the USA. I am a great writer folks, I believe it but when has anyone ever taken my advice, never. SIRMANS LOG: 15 MAY 2016, 1630 HOURS. I think most of you have heard the saying “Being dead right”, so who wants that? I think when it come to politics many of today’s conservatives are just plain shallow and lacks a true understanding of human nature, period. Sure, for a conservative to focus on cutting social programs is sensible and the right thing to do thirty years or more ago, but today in 2016 it is just plain shallow, dumb, stupid, and a recipe for getting booted out of power. And it is a waste of time because our welfare state beast will never allow any worthwhile cuts anyway. This full-blown super welfare state we have today has far too many government dependents for any individual or political party to put a dent in it and remain in power. Sure, this welfare state tolerate conservatives now because conservatives holds the moral high ground, but at the first sign of any real hardship and pain due to social programs cuts all conservatives will be booted I assure you. This great country was built on conservative values and today’s conservatives are right for wanting to do the sensible thing and live within our means, but they are too shallow to realize that our welfare state beast is much too powerful. I repeat it is shallow, dumb, and stupid to think any individual or political party can force responsibility and accountability peacefully on our full blown welfare state beast, it Ain’t gonna happen. This is where my almost supernatural wisdom comes into play and I will explain. When speaking of force almost everyone will think in terms of physical force, which is out of the question. The reason a genuine true free market place economy is so successful and will produce far more production than any other system known to man is because of its discipline. Discipline is the same key ingredient found in every successful system. Nature itself operates on its own law of free “Natural selection”. All great nations fall from within and nothing on earth is capable of taking down our welfare state beast, except a true genuine free market place economy, period. Our USA today no longer even comes close to having a true free market place economy. If conservatives expect to save our USA they have one chance and one shot before being booted out of power, otherwise it is political suicide to expect to take down our welfare state beast and survive in power. 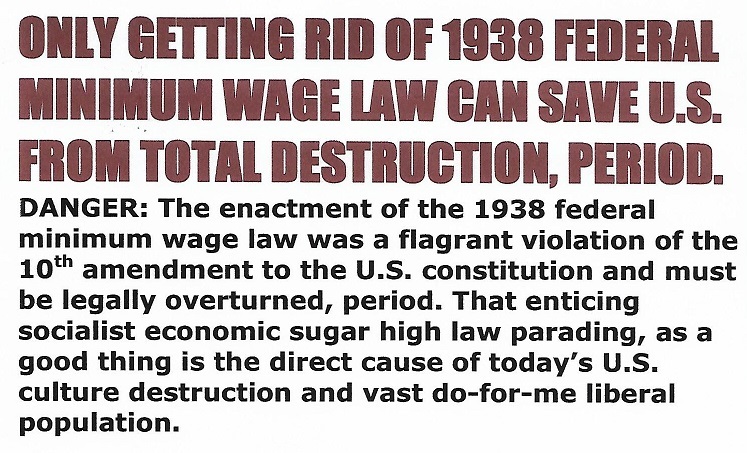 The only way to save the USA and western civilization is to untie the USA economy by repealing the 1938 minimum wage law then a true free market economy will kick in and save our civilization, nothing else has the power to save us. Repealing the 1938 minimum wage law will drain the liberal swamp, boom the economy, and then new growth will abound unhindered, otherwise we will just continue on our path to sure doom. SIRMANS LOG: 12 MAY 2016, 1749 HOURS.